Le Châtelier’s principle states that if a stress is applied to a system, the system shifts to relieve that applied stress. Regardless of the form the stress takes, the reaction is temporarily moved out of its equilibrium state. This is either because the concentrations or partial pressures of the system are no longer in the equilibrium ratio or because the equilibrium ratio itself has changed as a result of a change in the temperature of the system. The reaction then responds by reacting in whichever direction—either forward or reverse—will result in a reestablishment of the equilibrium state. Le Châtelier’s principle applies to a wide variety of systems and, therefore, appears as a fundamental concept in all three MCAT science sections. When reactants or products are added or removed from a reaction in equilibrium, the reaction is moved from its minimum energy state. With the change in concentration of one or more of the chemical species, the system now has a ratio of products to reactants that is not equal to the equilibrium ratio. In other words, changing the concentration of either a reactant or a product results in Qc ≠ Keq. If reactants are added (or products are removed), Qc < Keq, and the reaction will spontaneously react in the forward direction, increasing the value of Qc until Qc = Keq. If reactants are removed (or products are added), Qc > Keq, and the reaction will spontaneously react in the reverse direction, thereby decreasing the value of Qc until once again Qc = Keq. Put simply, the system will always react in the direction away from the added species or toward the removed species. In the tissues, there is a relatively high concentration of CO2, and the reaction shifts to the right. In the lungs, CO2 is lost, and the reaction shifts to the left. Note that blowing off CO2 (hyperventilation) is used as a mechanism for dealing with acidemia (excess H+ in the blood). This buffer system plays a key role in the respiratory, circulatory, and excretory systems, discussed in Chapters 6, 7, and 10 of MCAT Biology Review, respectively. We often take advantage of Le Châtelier’s principle to improve the yield of chemical reactions. For example, in the industrial production of chemicals, products of reversible reactions are removed as they are formed to prevent the reactions from reaching their equilibrium states. The reaction will continue to react in the forward direction, producing more and more products—assuming reactants are continually replaced as they are consumed. One could also drive a reaction forward by starting with high concentrations of reactants. This will lead to an increase in the absolute quantities of products formed, although the reaction will still eventually reach its equilibrium state unless products are removed as they are formed. Because liquids and solids are essentially incompressible, only chemical reactions that involve at least one gaseous species will be affected by changes in the system’s pressure and volume. When a system is compressed, its volume decreases and its total pressure increases. This increase in the total pressure is associated with an increase in the partial pressures of each gas in the system, and this results in the system no longer being in the equilibrium state, such that Qp does not equal Keq. The system will move forward or in reverse, always toward whichever side has the lower total number of moles of gas. This is a consequence of the ideal gas law, which tells us that there is a direct relationship between the number of moles of gas and the pressure of the gas. If one increases the pressure of a system, it will respond by decreasing the total number of gas moles, thereby decreasing the pressure. Note that this scenario assumes that the volume of the system was decreased and then held constant while the system returned to its equilibrium state. When one expands the volume of a system, the total pressure and the partial pressures decrease. The system is no longer in its equilibrium state and will react in the direction of the side with the greater number of moles of gas in order to restore the pressure. The left side of the reaction has a total of four moles of gas molecules, while the right side has only two moles. When the pressure of this system is increased, the system will react in the direction that produces fewer moles of gas. In this case, that direction is to the right, and more ammonia will form. However, if the pressure is decreased, the system will react in the direction that produces more moles of gas; thus, the reverse reaction will be favored, and more nitrogen and hydrogen gas will reform. Le Châtelier’s principle tells us that changing the temperature of a system will also cause the system to react in a particular way to return to its equilibrium state. However, unlike the effect of changing concentrations or pressures, the result of changing temperature is not a change in the reaction quotient, Qc or Qp, but a change in Keq. The change in temperature does not cause the concentrations or partial pressures of the reactants and products to change immediately, so Q immediately after the temperature change is the same as before the temperature change. Thus, becauseKeq is now a different value, Q no longer equals Keq. The system has to move in whichever direction allows it to reach its new equilibrium state at the new temperature. That direction is determined by the enthalpy of the reaction. If a reaction is endothermic (ΔH > 0), heat functions as a reactant; if a reaction is exothermic (ΔH < 0), heat functions as a product. Thinking about heat as a reactant or product allows us to apply the same principles we used with concentration changes to temperature changes. The equilibrium position can be shifted by changing the temperature. When heat is added and the temperature increases, the reaction shifts to the right, and the flask turns reddish-brown due to an increase in [NO2]. When heat is removed and the temperature decreases, the reaction shifts to the left, and the flask turns more transparent due to an increase in N2O4. This demonstrates Le Châtelier’s principle because the equilibrium shifts in the direction that consumes energy. Figure 6.3. Example of a Reversible Endothermic Reaction, N2O4(g) ⇌ 2NO2 (g) Left: As temperature decreases, the equilibrium favors N2O4 production, turning the reaction vessel more transparent. 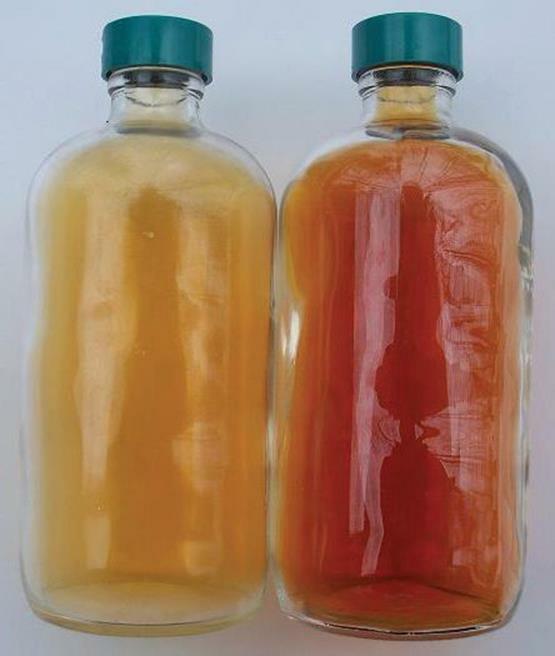 Right: As temperature increases, the equilibrium favors NO2 production, turning the reaction vessel reddish-brown. Before you move on, assess your understanding of the material with this question.